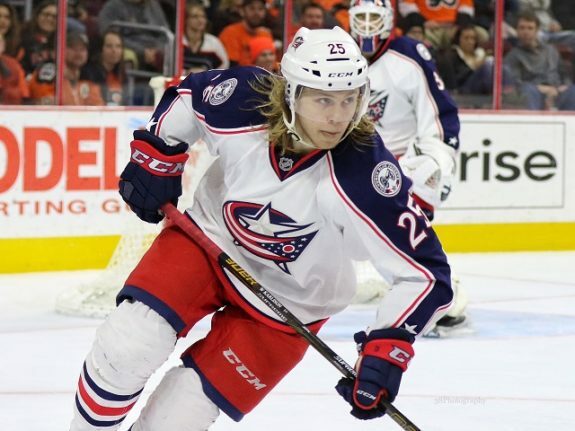 The Columbus Blue Jackets haven’t made much news in recent days. But that doesn’t mean things aren’t active within the walls of Nationwide Arena. With the NHL Combine, Expansion Draft and NHL Entry Draft all coming up, we thought now was the perfect time to bring our Blue Jackets’ writers together for an offseason roundtable. The team faces some tough decisions in the coming months. What do we expect to happen? Joining in on our roundtable are Kenyon Clevenger, Jeff Schaffer, Dan Dukart and yours truly. We will each answer six questions about the team and this offseason. We will answer the first three questions here and the other three questions in Part 2. Our focus here is on the Expansion Draft and Entry Draft. Part 2 will address the salary cap and other offseason moves. 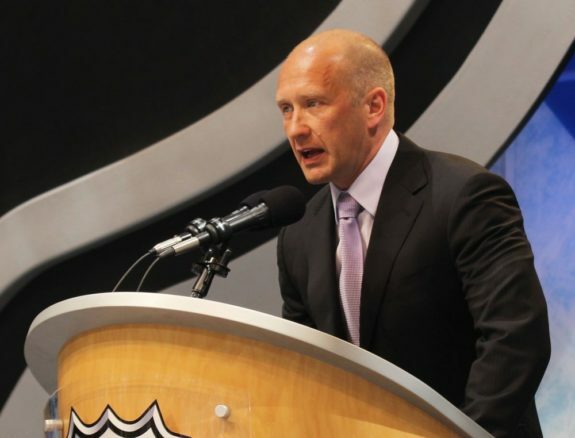 Columbus GM Jarmo Kekalainen will lose a good player in the expansion draft. So Who Do the Blue Jackets Lose? Question 1: Everyone has June 21 circled on their calendar as that is the day we will find out the official roster for the Vegas Golden Knights. GM Jarmo Kekalainen has said the Blue Jackets will lose a “good player” to the Golden Knights. Any idea as to who the Blue Jackets will lose on June 21? Kenyon: I think there are three options that Vegas is looking at in regards to who they will draft from the Jackets’ roster: forwards Josh Anderson and William Karlsson along with goaltender Joonas Korpisalo. Anderson is likely tops on their list as he had a stellar rookie campaign, scoring 17 goals and recording 147 hits as a third line banger. He displayed he can score goals playing a fast, physical game, which makes him the #1 option for Vegas. Blue Jackets’ management would probably be wise to spend a draft pick or two to keep Anderson in Columbus as he has proven to be a valuable part of their team. He’s definitely worth keeping in union blue. If Vegas doesn’t select Anderson, I think Karlsson would be a good pick as well for them. He plays his role well as a third or fourth line two-way center who is exceptional in his own zone and at killing penalties. He’s not going to light up the scoreboard but if Vegas cares about keeping the puck out of their own net, Karlsson is a forward who can help with that. If not Anderson nor Karlsson, Korpisalo is an up-and-coming goaltender who is bound for a lengthy career in the NHL. He perhaps didn’t show it this year but in 2015-16, he filled in nicely for injured Sergei Bobrovsky for the majority of that season and was solid between the pipes. The young Finn would be a great pick for Vegas if they want to draft a goaltender with élite potential. Jeff: After his performance in games 4 and 5 of the team’s latest playoff series against the Penguins, I wouldn’t be surprised if William Karlsson goes to Vegas. He was one of if not the best Columbus forward in the final games of the team’s postseason appearance. Though sometimes inconsistent, he has proven himself as an effective defensive center and strong penalty killer. At only 24, Karlsson could become a relatively cheap bottom- or middle-six forward for several years as the Golden Knights establish themselves in the league. Goalie Joonas Korpisalo is another possible expansion draft loss. The Blue Jackets saw enough from the 23-year-old to make him Sergei Bobrovsky’s backup, so it’s certainly possible the Golden Knights see him as an NHL goalie now or in the near future, and a young goalie with potential is always a good thing to have, particularly for a brand new franchise. While Karlsson and Korpisalo are all but guaranteed to be available in the expansion draft, various circumstances/decisions by management could leave Josh Anderson or even Boone Jenner exposed as well. If either are left unprotected, I’d expect them to be snatched up by Vegas. Dan: I think it can be reasonably narrowed down to a few guys, and Joonas Korpisalo is my front-runner. I can’t imagine a scenario where the Blue Jackets expose Josh Anderson, and when all is said and done, I think Jack Johnson will be exposed and subsequently passed-over by Vegas due to his age/salary/UFA status after 2017-18. As of this writing, it looks like Vladislav Gavrikov will stay in the KHL. If he signs with Columbus, though, I think that could change some thinking, and it wouldn’t be improbable that they choose to expose the oft-injured Ryan Murray. In that case, he would have to be considered a leader in this category, as well. Dark-horse pick? William Karlsson. Perfect world? Matt Calvert, though I’d be sad to see the longest-tenured Blue Jacket leave town under these conditions. Mark: The Blue Jackets are one of the few teams that have 3-4 solid choices that Vegas could target. They have a goaltender in Joonas Korpisalo that does not need waivers for the AHL. Their entire third line is at-risk with each bringing something different that Vegas could like. A good defenseman could also be available. Someone’s gotta go under expansion rules. At this point, I’m down to two, William Karlsson and Josh Anderson. Unless the Blue Jackets make a trade with Vegas, it’s very likely one of these two will not appear on the protected list. I think you protect one of Karlsson or Anderson and make a deal to keep the other. In that case, Korpisalo could go. So could Matt Calvert. With a trade, I see Korpisalo the victim. Otherwise I see Anderson the victim. Reason I have Karlsson over Anderson is that Anderson is more easily replaced with other wingers in the system coming up. Center is already enough of a problem for the Blue Jackets that I can’t see them taking any chances losing Karlsson. Anderson is a good player, but it’s not like that’s an elite-level loss. Once Pierre-Luc Dubois or Vitali Abramov are ready, that softens the blow on a potential Anderson loss. The above is contingent on Scott Hartnell waiving his no-move clause. Many believe he will waive, but nothing is official at this time. What Does Your Protection List Look Like? Question 2: We now know that David Clarkson is exempt from the expansion draft. Assuming a 7-3-1 protection list, what does your protection list for the Blue Jackets look like? Note that at forward you don’t see Scott Hartnell’s name and in his place is Josh Anderson. Hartnell has a No Trade Clause, at least for the moment, meaning he must be protected as long as the clause is in place. If the Jackets can strip it, they can open up a spot for one of their younger guys who they value more than an aged veteran who isn’t going to be selected by Vegas anyway. So, instead of giving up picks to protect Anderson from Vegas, they remove the No Trade Clause from Hartnell and all is good – or all the good that it can be in relation to the expansion draft. Jeff: Saad, Foligno, Dubinsky, Atkinson, Jenner, Wennberg, Anderson*, Jones, Savard, Murray, Bobrovsky. *With the caveat that Scott Hartnell doesn’t need to be protected, due to a transaction or waiving NMC. If not, Hartnell takes this spot by default. 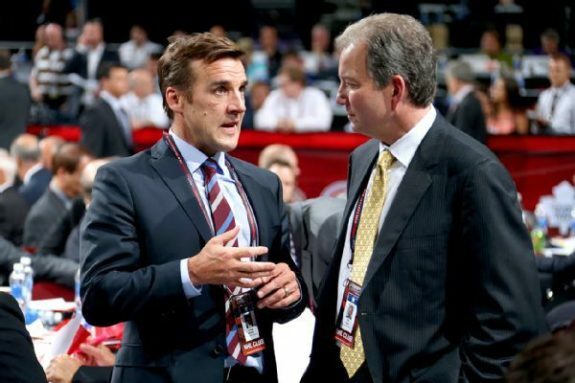 George McPhee will have plenty of talent to choose from off of the Blue Jackets’ roster. 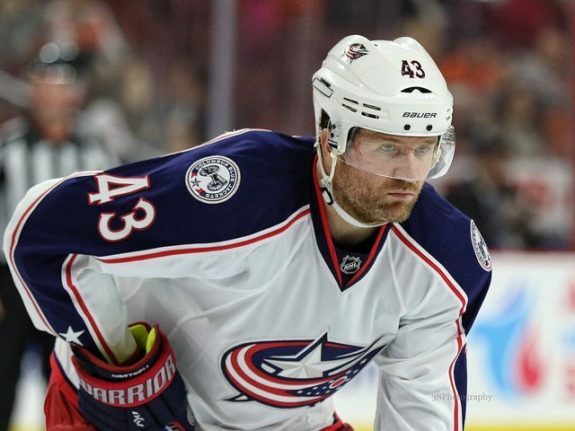 Dan: I’m going to preface my prediction by saying that Scott Hartnell is purposefully left off of this list – either by way of contract buy-out or by waiving his NMC. That said, if I were managing the team, my list would be: Dubinsky, Foligno, Saad, Wennberg, Atkinson, Anderson, Jenner, Jones, Savard, Murray, Bobrovsky. Mark: This seems pretty cut and dry to me assuming Hartnell waives his NMC. Sergei Bobrovsky is the goalie protected as he has a NMC. The three defensemen protected should be Seth Jones, David Savard and Ryan Murray. Remember Zach Werenski does not need protected as he doesn’t have three professional seasons under him. At forward, Nick Foligno and Brandon Dubinsky have NMCs. I’d also protect Brandon Saad, Alexander Wennberg, Cam Atkinson and Boone Jenner. That leaves one more spot assuming Hartnell waives. To me, Karlsson or Anderson? As explained above, I’d protect Karlsson. They need centers. Unless there’s a major shakeup in the form of a trade, the top-3 centers in 2017-18 are Wennberg, Dubinsky and Karlsson. Now take Karlsson out. Ouch! He’s harder to replace than Anderson. Question 3: The NHL Draft goes two days after the Expansion Draft. What do you foresee the Blue Jackets doing with their first-round pick? Any names come to mind as a good fit for the Blue Jackets? Kenyon: We have seen in years past that the Blue Jackets’ list isn’t the same as everybody else’s at the NHL Draft. They aren’t afraid to trade up to get a player that they like and rank high (see Gabriel Carlsson in 2015). We all know that Jarmo Kekalainen’s strategy is to take the best available player when they’re on the clock. Sometimes that selection will fill a need, sometimes it won’t. Right now, the Jackets don’t really have many needs. They are still searching for a franchise centerman. Wennberg could end up being the guy for that job but it’s not certain. They could also use a little more goaltending depth. However, none of these needs mean anything when it’s their turn to pick because they’re going to draft their top-ranked player regardless of need. The 2017 NHL Draft is widely discussed as one of the weakest in recent years. The Jackets likely won’t find their franchise centerman in the first round of this draft because of the weaker pool of players. However, that doesn’t mean these players aren’t going to be any good. 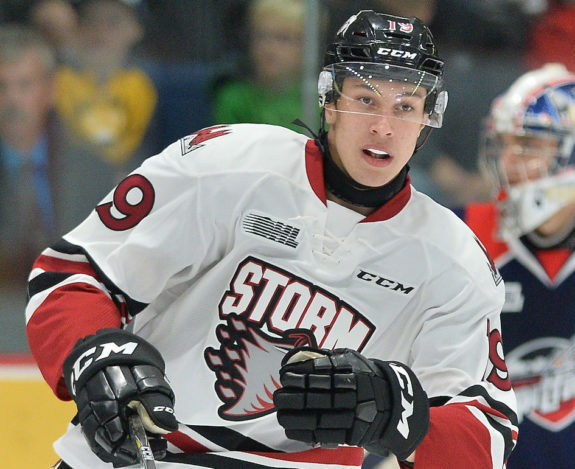 There are a handful of forwards that could be available for the Jackets at pick #24, including Isaac Ratcliffe of the Guelph Storm, Robert Thomas of the London Knights and Maxime Comtois of the Victoriaville Tigres. Ratcliffe is huge (6’6” and 200-plus pounds) and is nearly impossible to knock off the puck when he has it. His possession game along with his big man’s game would fit right in with the blue-collar style of the Jackets. Thomas is a tremendous two-way center who averaged a point per game this year with London. Multiple scouts have compared him to Vancouver’s Bo Horvat. The Blue Jackets love guys that can play a 200-foot game so adding Thomas would make a lot of sense. Comtois is a big power forward who loves battling in front of the opponent’s net and owns a great wrist shot. His numbers were down this year but he’s a guy that would fit well with the Jackets given his physical, no-nonsense style of play. A couple defensemen that the Blue Jackets might go after are Henri Jokiharju of the Portland Winterhawks and Urho Vaakanainen of JYP of the SM-Liiga. The Jackets have somewhat of a pipeline through Portland it seems as they’ve selected former Portland players Ryan Johansen, Oliver Bjorkstrand and Paul Bittner in the last seven years and have former Winterhawks Brandon Dubinsky and Seth Jones on their current roster as well. Jokiharju is a fluid-skating, puck-moving, right-handed defenseman who possesses sound offensive capabilities. Vaakanainen is also a fluid puck-mover but is left-handed. He has shown maturity playing in Finland and is projected to be a top-pairing defenseman. Either of these defensemen or any of the forwards above would be great options for the Jackets in round one of the draft this summer. Jeff: With a group of young defensemen including Zach Werenski, Seth Jones, Ryan Murray, Markus Nutivaara and Gabriel Carlsson, Columbus has one of the most promising blue lines in the NHL. However, it’s hard to know just how long the Blue Jackets can retain all those defenders as their current contracts expire. Jones is locked up through 2021-22 and Werenski seems destined for quite a payday when his entry-level deal expires after 2018-19. Carlsson’s contract ends the same season, while Murray and Nutivaara both need new deals one year sooner. Combine that situation with the long-term deals owned by Jones and David Savard and it seems unlikely that the Blue Jackets will be able to afford to keep everyone. Now, why rant for a paragraph about current defensemen to answer a question about the draft? That situation is a long way of saying Columbus could look to draft a defenseman in round one. Werenski, Nutivaara and Carlsson are all on entry-level contracts, meaning bigger cap hits for their next deals. The Blue Jackets will likely need some inexpensive help to round out their defensive corps in a few years. Ryan Collins and/or Andrew Peeke could fill that role, but it wouldn’t hurt to grab someone with a first-round pick this year, perhaps Juuso Valimaki or Erik Brannstrom. I could also see Columbus looking for a forward with some size like Kristian Vesalainen if he’s available. Dan: It’s so hard to project the top of this year’s draft, let alone the end of the 1st round. When picking later in the draft (24th to be precise), I subscribe to the ‘take the best player available’ philosophy, regardless of organizational depth at different positions. I’ll list four players I would love to see drafted with their first round pick: If defenseman Callan Foote is available, I think he’d be a nice pickup. Kelowna has a history of sending top flight blueliners to the NHL (Shea Weber, Duncan Keith), and they always seem to somehow fly a bit under the radar. 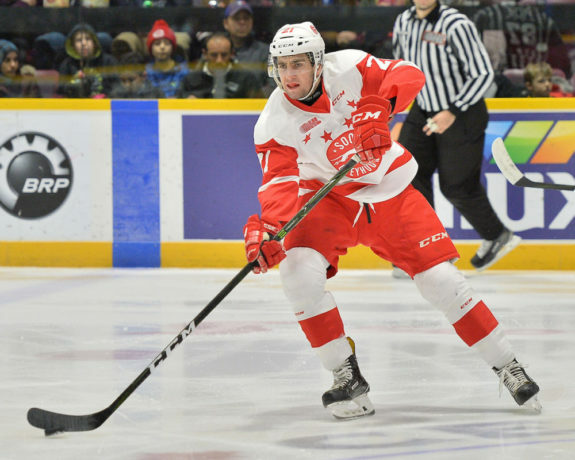 Nicolas Hague, the monster defenseman from Mississauga of the OHL, would also be a nice addition. I could also see a scenario where a highly-touted prospect falls due to serious discrepancy among the 31 team’s draft boards this year. Klim Kostin, for example, would be a steal if he fell to the mid-20’s, similar to Vitaly Abramov falling all the way to #65 last season, but I’m not holding my breath. Lastly, I think a guy like Josh Norris would be a nice fit for Columbus. He’s a projected top six center that was the No.1 center for the USNTDP this past year. He’s heading to Michigan – and we all know how the last Blue Jackets 1st round pick from U of M turned out. Mark: As with all drafts, it depends on what happens with the picks before them. The Blue Jackets will create their own master list and go from there. With that said, I do believe the Blue Jackets will prioritize centers and defensemen. At the 24th spot, they will have no shortage of players to pick from. At center, players like Ryan Poehling, Shane Bowers, Robert Thomas and Josh Norris are possibilities. On defense, watch for names like Conor Timmins and Nicolas Hague. Stay tuned for our Blue Jackets draft guide coming this June for a full breakdown of players we think the Blue Jackets will key in on. As for that list, I would order them like this: Poehling, Hague, Timmins, Bowers, Thomas, Norris. Poehling is raw and needs time, but projects as a next-level center. Hague and Timmins would each boost the defense. Bowers, Thomas and Norris would each help down the middle. I believe Poehling is gone before the Blue Jackets pick, so you’ll see me pushing for Timmins as we get closer to the draft. He’s a right-shot defenseman who will help on the power play. He’s just a solid defenseman and one of the best in the OHL this past season. That’s it for part one. Stay tuned for part two as one of the questions we will discuss is which Blue Jacket has the most pressure on them in 2017-18.